Welcome back to our blog! Now that summer is right around the corner, many of you have probably started planning your summertime getaways. While some of you may be planning to take along your furry friend on your summer adventure, others may be looking at other options for their dog while they’re away. At Sun Valley Animal Center, we offer two different dog boarding options at our Pet Lodge and Pet Ranch, where your pup can come stay in a safe, fun, and monitored environment. The Sun Valley Pet Ranch offers cage-free, in-home dog boarding where your dog can play and frolic without being kenneled. The Sun Valley Pet Lodge is another great option that features comfortable enclosures where your dog can nap and play. At the Pet Lodge, your dog can play in large outdoor yards several times a day and can even swim during the summer. To find out more about these amazing dog boarding services, follow this link to our Dog Boarding page. 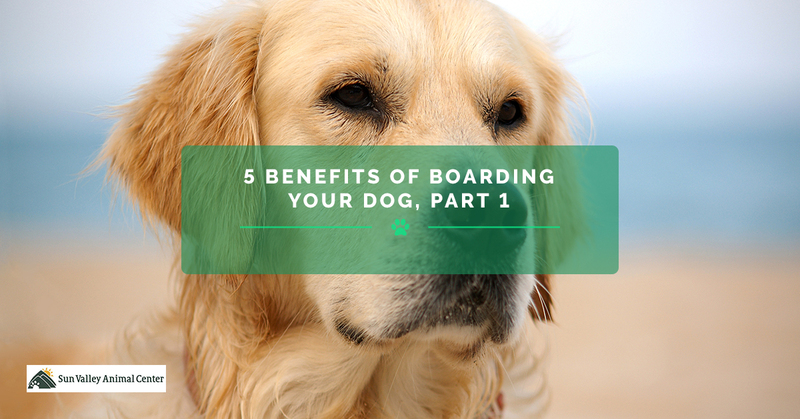 Today, let’s explore some of the many benefits of boarding your dog while you’re on vacation. When you board your pup at a reputable dog boarding facility like ours, you can rest assured that your dog will get plenty of exercise from walking, hiking, running, and playing outdoors in one of our five yards (weather permitting). We also provide an indoor dog run for those days when the weather is unfavorable. Boarding your dog gives your pup a chance to interact and socialize with other dogs and other humans in a safe and controlled environment. Because dogs are pack animals, socializing and playing with other dogs can be a great advantage for improving their behavior and their socialization skills. When your dog comes to stay with us, they will be placed in a playgroup according to their age, size, and temperament. Of course, we will only place in them in playgroups and in contact with other dogs if they have the ability to socialize. Why leave your dog at home with friends and family who want to help but may not have as much experience with dogs? Boarding your dog gives you peace of mind in knowing your precious pup is being taken care of by professionals who have received the proper training and have the experience to care for your dog. Our highly trained dog boarding staff can not only play and interact with your dog, but can also bathe them, walk them, and take them on hikes. At Sun Valley, our animal care specialists are devoted to providing your pup with the care and companionship they need during their stay with us. If you have a vacation coming up and want to board your dog in a safe, fun, and loving environment, call Sun Valley Animal Center to reserve a spot for your pooch in our Pet Lodge or Pet Ranch. We’ll take care of your dog as if they were our own. Our dog boarding specialists have the training, experience, and skill necessary to care for your dog while you’re away, so contact us today to learn more about our dog boarding facilities.